Lafayette Radio Corp.; New York, N.Y., 100 Sixth Avenue (Syosset). 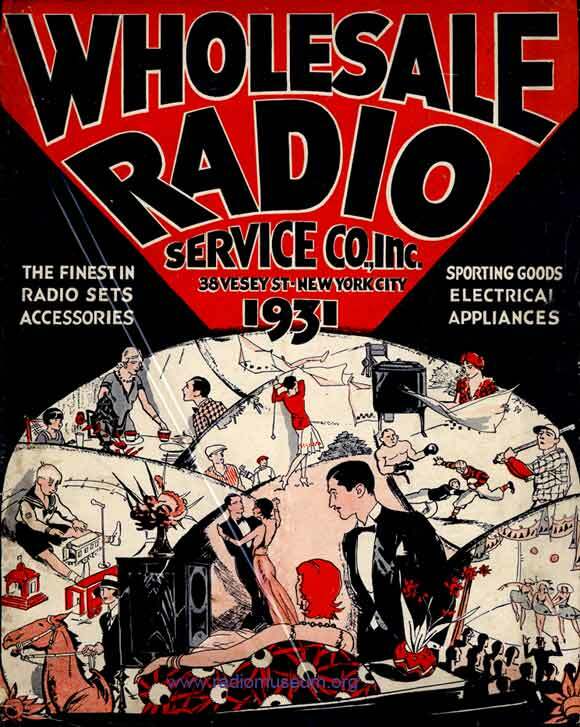 Formerly: Wholesale Radio Service Co. Inc. The company sold radio sets, amateur radio equipment, citizen's band (CB) radios, and other communications equipment, as well as electronic components and even tools, through retail outlets as well as by mail-order. Rider's names the organization (for model D6): "Lafayette Radio" and below that: "Radio Wire Television Inc."
"Lafayette" branded tubes were made for the company from the early 1930s, but the manufacturer's name is not known. We have to keep the part for the birth and early days of the brand Lafayette as a forum article to be flexible and constantly looking for new facts - until we have a clear and sound picture of that early period of Lafayette. See also the growing informaition about the early catalogs. According to Alan Douglas, Lafayette was run by Abraham Pletman and Leonard Welling, but we don't know yet in which period. 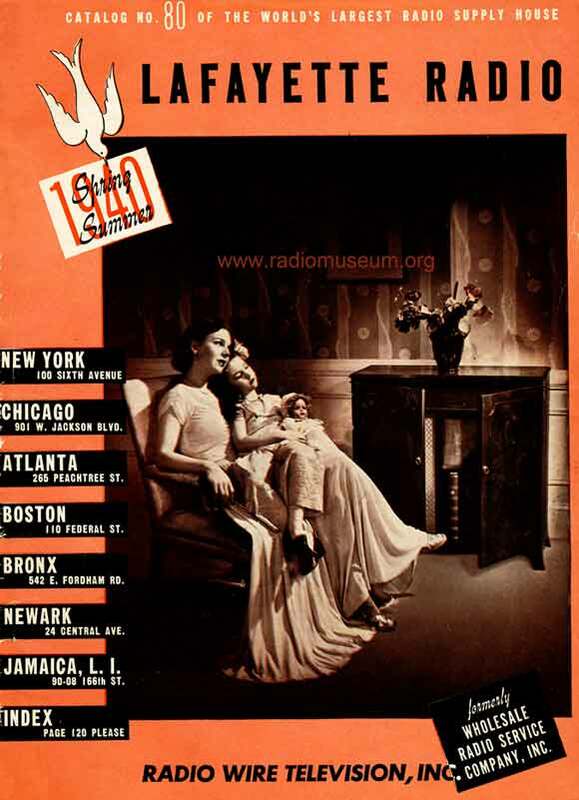 Lafayette Radio Electronics Catalogs were well known in the 40's - for instance the 1949 Lafayette Concord Radio Catalog when they had 3 mail order centers (Chicago, New York and Atlanta). In 1961 Lafayette uses two addresses which are published in the catalog 1935 of "Federated Purchaser". According to the catalogue of 1973 they started at the beginning of the 20's to sell via catalogs. Most of Lafayette's models were not the best performers nor were they the worst performers. 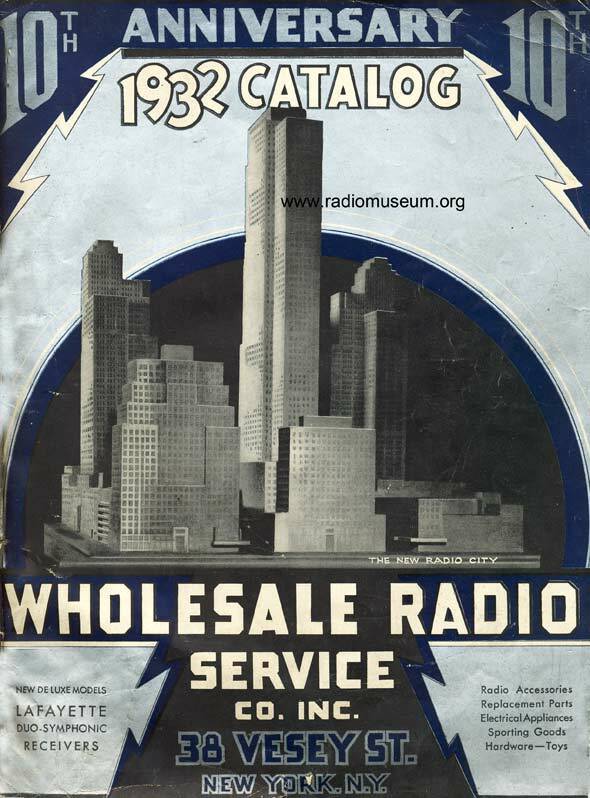 In 1933 the catalog is number 53 and shows the address "Wholesale Radio Service Co., Inc., 100 Sixth Avenue, New York NY. Rider's volume 4 lists Lafayette only under "Misc." (miscellaneous, models A-11, A-12, A-14 and A-19) and only beginning with volume 5, Lafayette is listed under the L for "Lafayette Rado & Television Corp.
At least a "Tube and Transistor Tester" made by Electronic Measurements Corp. (EMC) is branded "LAFAYETTE Radio Electronics Corp. Syosset, NY". We have not yet sufficient information for knowing the "ties" of those two brands/companies. 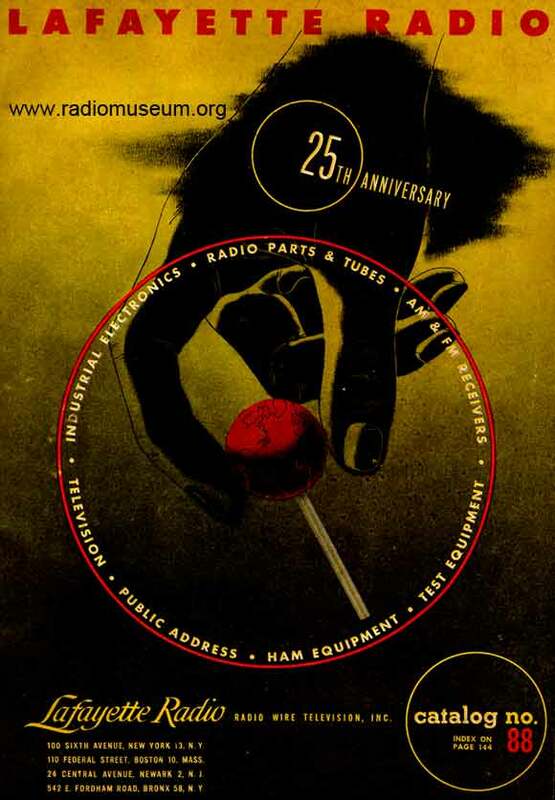 Products of Lafayette Radio Electronics Corp. ranged from tranceivers for HAMs and CBers, and shortwave listeners to normal stereo gear - as can be seen on the front page of "1955 Lafayette Radio Electronics Catalog". 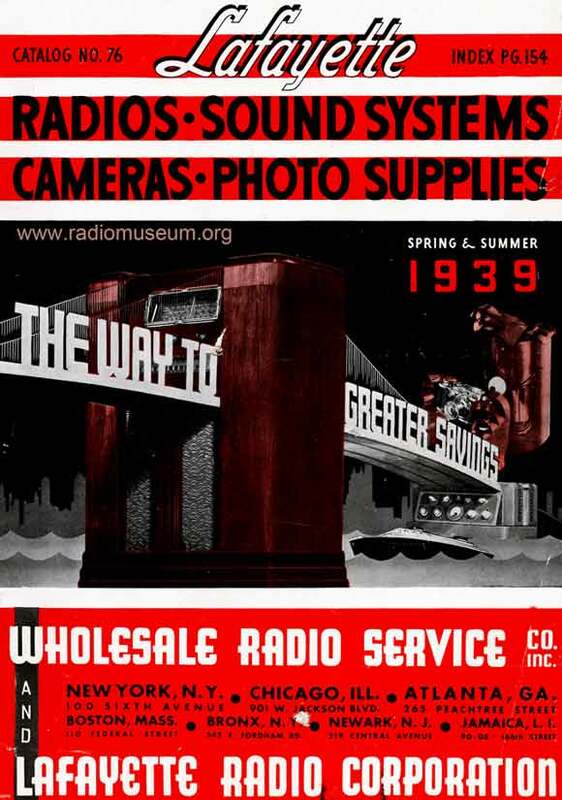 Then they claimed to be: "The worlds greatest radio, TV and Hi-Fi center" (Catalog 10-55). 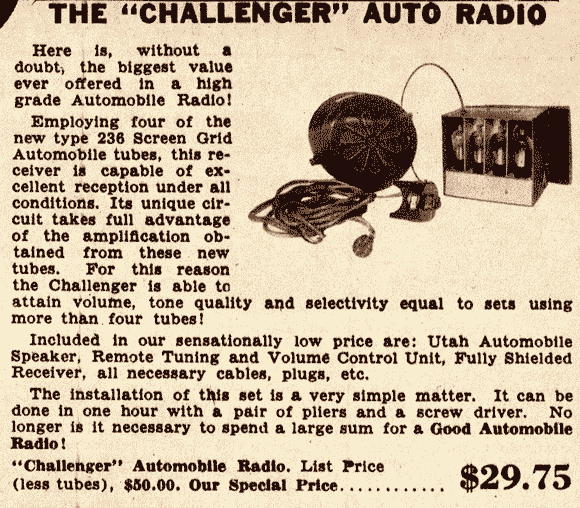 They marketed many types with special functions, such as VHF receivers for police and fire channels built into a CB radio - but also already in 1955 "Transistor Parts". A complete model line included many models and brand names to choose from for just about any purpose, as opposed to just a few. The product line also covered other manufacturers' products through seasonal catalogs. The company's best selling products were often shortwave receivers, parts, and portable radios. In the 1960s, most Lafayette brand radios were rebranded Trio-Kenwood sets, which were of moderate performance and build quality. There is evidence that from the mid-1950's the firm was negociating licence agreements with foreign radio manufacturers. Evidence of this is the sale in the US of the Japanese Sharp 5M-67 five valve superhet table top radio as the Lafayette model FS-103,the set produced by Sharp from 1955-56. The downfall of LaFayette Radio began in the early 1970s, following the poor choice to invest in 23-channel CB radios, rather than the 40-channel CB radios approved by the FCC. With less than 100 stores, far fewer than the aggressively expanding Radio Shack's thousands of local outlets, Lafayette Radio remained more of a dedicated enthusiasts' store than a mass marketer. The banned 23 channel CB radios became illegal for sale, resulting in unsold stock in the company's warehouses. The next blow to the company was the upcoming of electronics retailers relying on aggressive marketing techniques and competitive pricing in the late 1970s. Formerly a national chain, the remaining Lafayette stores in the state of New York closed by the end of 1979. Some local Lafayette stores remained open until 1981. For example, the Long Branch, New Jersey store finally closed in the Fall of 1981. Unsold inventory was literally shovelled into dumpsters overnight to vacate the store. By the late 1970s Lafayette lost a very competitive battle with the Radio Shack stores. The last Lafayette store closed in 1981. As of 2003, the Lafayette brand name was re-launched at the CES show that year. Their products are only offered through special dealers and limited retail stores. USA 60 Communications Receiver HE-52 6AL5 Frequency range: 148 - 175 MHz, AM or FM. USA 68 Deluxe Genometer 6AG5 That unit appear to be identical to Accurate Instrument 156 model. Front page Lafayette catalog 1931 for season 1930/31. 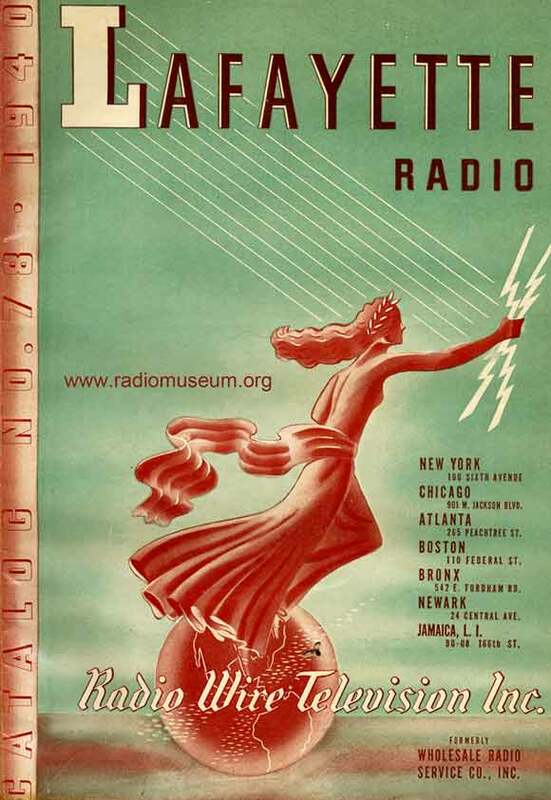 Lafayette radio catalog 1931 Spring-Summer, cover page. adio Catalog for Dealers & Servicemen, 1931. A second small catalog - front page. Lafayette 10th Anniversary Catalog 1932 (Wholesale Radio Service Co. Inc., New York City. From the Lafayette 10th Anniversary Catalog 1932. 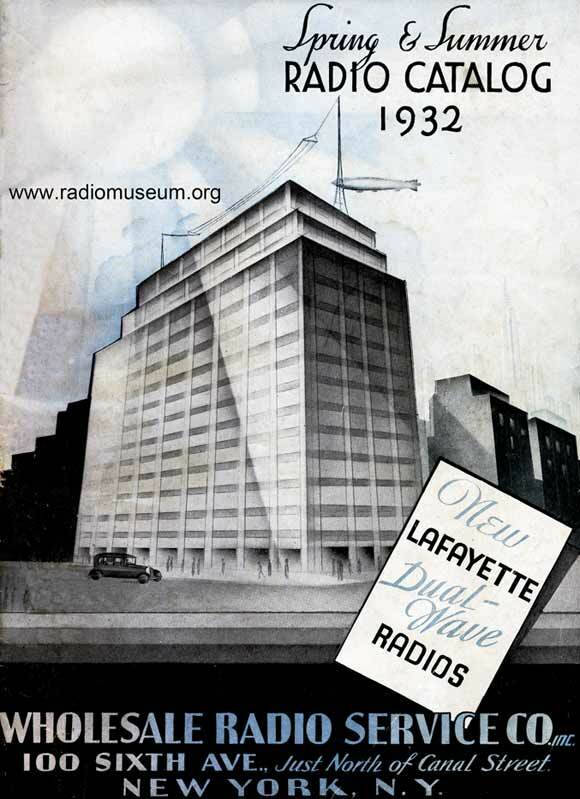 Lafayette radio catalog 1932 Spring & Summer, cover page. Lafayette radio catalog no. 54, 1933 Spring-Summer, cover page. Lafayette radio catalog no. 55, 1934 for season 1933/34. Lafayette catalog no. 57 for 1935. Lafayette Radio Catalog no. 63, Spring 1936, cover page. Lafayette Spring/Summer catalog 1937 (no. 68). Lafayette Radio Catalog no. 69, 1938 for season 1937/38. Lafayette Catalog no. 71, 1938 Spring, cover page. Lafayette Gift Catalog no. 75, 1939 for Christmas 1938. Lafayette Radio Catalog no. 76, Spring & Summer 1939, front page. Lafayette Radio Catalog no. 78, 1940 for season 1939/40, front page. Lafayette Radio Catalog no. 80, 1940 Spring-Summer, front page. Front page Lafayette catalog no. 82, 1941 for season 1940/41. Lafayette Gift Guide Catalog no. 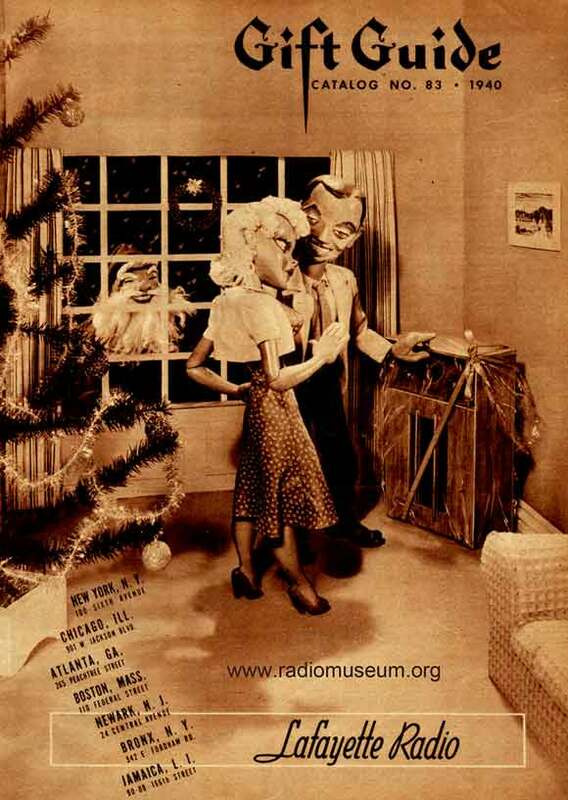 83, 1940 from Lafayette Radio Corporation. This name, the number 83 and the copyright notice 1940 indicates that it is made for Christmas 1940 (not 1939). We will check with the models. Lafayette Radio Catalog no. 86, 1941-2, front page. Company name is then "Radio Wire Television Inc.". Supplement C (Newark Branch) to Lafayette Radio Catalog no. 55, 1934: Front cover. Lafayette Electronics Catalog no. 600, 1960, front cover. Lafayette Radio Catalog no. 88, 1947, front cover. Front cover page of one of the two Lafayette catalogs no. 87. The other is called "Radio for Victory". 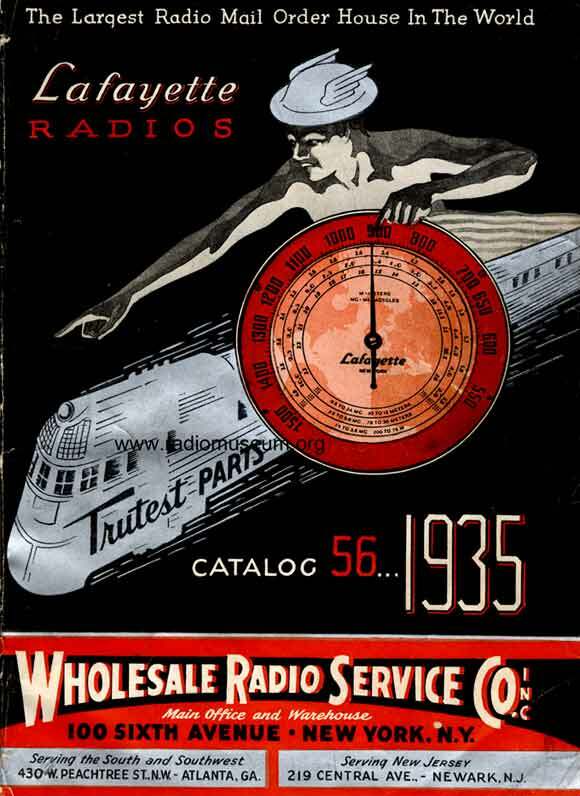 Lafayette Radio Catalog 1930 - Wholesale Radio Service Co.
See also the next main catalog, the Lafayette Radio Catalog 1931 without number (for the season 1930/31) and the main catalog before - if there was one. At the moment we have not seen one for before. At the moment this is the only catalog I know with a person named. Since I live in Switzerland, I have no chance to check any register in New York to find out more about early Lafayette members etc. If a member or guest knows more or can find out for us I would be very glad to receive a contact form. Thank you. Both, "Radios Collector's Guide 1921-1932" (McMahon) and Rider's Perpetual volume 1 show this model under "Wholesale" instead of "Lafayette". See also "Duo Symphonic 1931" with dual volume control (antenna and AF stage) and "Great Duo Symphonic". According to McMahon, the Duo Symphonics have one untuned RF circuit and 3 tuned RF circuits - but Rider's shows clearly that it has 4 tuned circuits (4 gang tuning condenser) and two stages AF with push-pull output. CX tubes are from Cunningham. Detector tube is the only screen grid tube C324 or a 224. The Lafayette Duo Symphonic is in fact using the Wells-Gardner & Co chassis model C or CG, first type. You see this clearly by comparing the Rider's schematic Wells-Gard. page 1-1 and 1-2 (see versions) with the schematic "Wholesale" page 1-2. It is the "Old Type" schematic. It can also have Cunningham tubes like CX326 (as variant). Nevertheless, Lafayette (Wholesale Radio Service Co.Inc.) describes this the following way: "The problems of our engineers was not only to build a receiver that would outperform anything in the world, but to build the dame receiver at a price that would bring it within reach of the average home." The catalog 1930 for season 1929/30 names this 9 tube TRF chassis a "Screen-Grid Neutrodyne Neutrodyne-Beers Double Primary". The Lafayette Duo-Symphonic Screen-Grid has a "special Utah Stadium Dynamic-Speaker chassis" producing from 30 to 5000 cycles. There is a linear power detection and local distance switch. Tubes 245 for push-pull operation. The same chassis is used for Lafayette Duo-Symphonic models 342, 316, 324, 370, 343, 300, 362, 357, 325, 329, 350 and 352, a Phono-Radio Combination. Starting with Lafayette Challenger, a true 8 tube TRF with Screen-Grid tubes and the models Challenger 40, 18, 30, 10, 85 and 20 (two knobs), followed by an other 8 tube Screen-Grid TRF, called TRIO with 3 knobs and the following models: Trio 210, 285, 218, 200, 260 and Trio Phonograph Combination. The "top model" with 9 tubes is a Neutrodyne, a technique which has then be overcome with the Screen-Grid tubes (of the two other models). It shows 3 knobs plus a local-distance switch right beside them. This model is only "top" by the tube count - but Wells-Gardner did offer it also in the next season. Who made those two chassis Challenger and Trio? 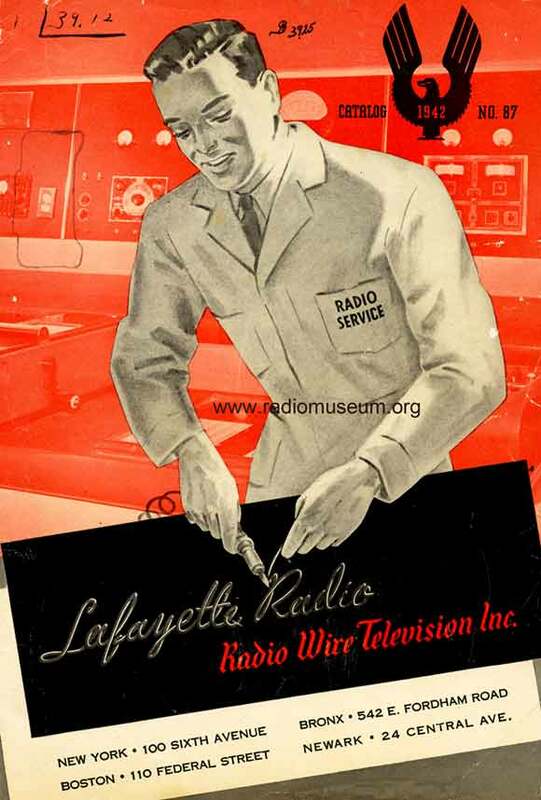 "Wholesale Radio Service Co. Inc." writes: "Super-Efficient Circuit --- Lafayette-Designed", going on with: "In our research laboratories, where we have available every conceivable type of testing apparatus, Lafayette engineers have developed this amazing new receiver. It is a distinctly new circuit design that gives the Challenger a tremendous advantage over all other receivers that may appear to be the same.". For me this is not yet the right answer ... I hope to find facts. Already 1916 screen grid tubes were patented in Germany by Schottky and its first use as tube SSI they were used in 1917 for telephone repeaters (see for instance Tyne, "The Saga of the vacuum tube). In 1924 A.W. Hull at General Electric (GE) began to develop a screen-grid tetrode for battery radios only. 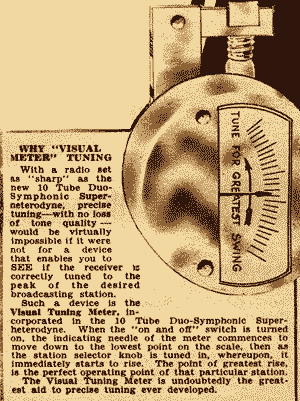 It was presented to RCA in 1926 and released as UX222 in October 1927 - as the last battery tube for many years. For AC mains radios RCA can present the UY224 as first US screen grid tetrode for mains operation in April 1929. 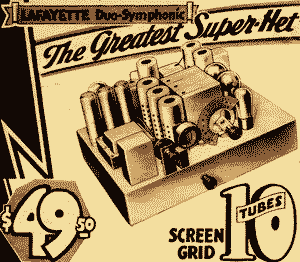 The two 8 tube TRF can be called then "state of the art" because 1929 was the introduction of the screen grid tube in the USA, whereas the Duo Symphonic uses it only for detection. Up to page 31 are the main radio models. Page 32 offers cabinets only. Page 33 starts with the "Speed" tubes 224 and 245 but offers also 201-A, 200-AA, 112-A, 171-A, 171-AC, 210-H, 250, 226, 227, 280, 281, 224-AC and 199-UV. The cheapest is the 201-A for $ 1.25 and the most expensive the power amplifying tube 250 for $ 11.00. 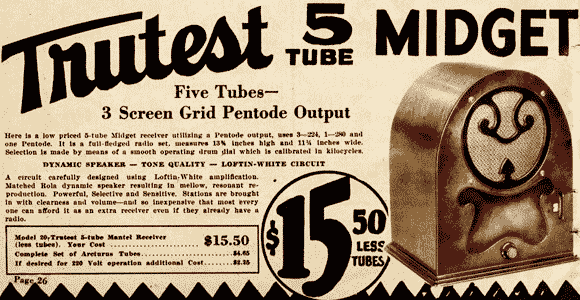 On the following two pages Lafayette offers those tubes under its own brand, the 201-A for $ 0.63 and the 250 for $ 5.50 - generally half price. This is followed by some other brands, the Supreme Diagnometer Model 400-B and the Trav-Ler "New Portable Radio Sets" DeLuxe and Aristocrat. Page 38 through 42 offers different loudspeakers. Different brands are offered like Wright-DeCoster, B-B-L, Celotex Baffle Horne, Utah models, Farrand Inductor, Best, Public Address Exponential Air column Horns and Racon 4320 exponential horn. There is also a Yaxley Electric Pick-up Fader. Page 43 offers a model 9-5 stage public address system with 250 push-pull amplifier for $ 377.75 including tubes and a "Dual Electric Phonograph Amplifier. Page 44 offers microphones from General Industries and others like the "Two-Button Broadcast type KK and BB or a model CC. Page 45-49 show a "Centralized Radio Equipment" for Hotels, Schools etc. model 30-9, 200-525 and 100-525 and the Magnavox speakers "The Carillon", "The Aristocrat", the "X-core dynamic", "The Stratford" and "The Campanile". The next 37 pages show very different offers - from Samson PAM amplifiers, General amplifiers like GA-15, GA-30 and GA-20, Silver Marshall 690, 679, 678PD and 677, Phonograph motors, Pick-up's, Power packs like Pilot ABC eliminator, batteries, measurement instruments, Counter tube checker model 533, Hammarlund HiQ-30-Screen Grid 9 tube AC receivers and amplifiers and the SW converter., National Screen Grid Short Wave 4-tube Thrill Box type SW-4, the National MB-29 five tube tuner, National Velvetone Power Amplifier, SM 722 Band-Selector Seven receiver, Silver-Marshall-712 tuner (development of Sargent Rayment Seven), Silver-Marshall 735 "Round the World Six", Aero SW kits, Pilot Super-Wasp Kit 14 to 500 meters, REL SW receivers, George W. Walter Multi-Unit, Amateur radios and transmitters, also as kits - and pages with parts. Page 80 shows a 6 tube "Pierce-Airo-Hamilton" battery receiver for $ 59.50, folowed by deVry moving pictures camera and projectors, new Remler 111 Screen Grid components. Only from page 87 follow some appliances, Lionel trains, a Victor electric adjustable washing machine for $ 69.50 as well as exercising machines and health lamps plus some sporting articles. 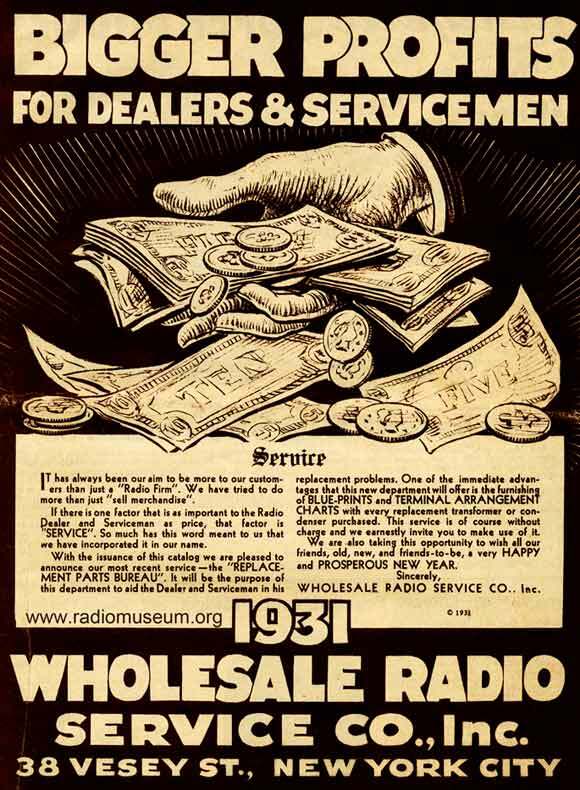 There is also a 32 paged Radio Catalog 1931 "Bigger Profits". 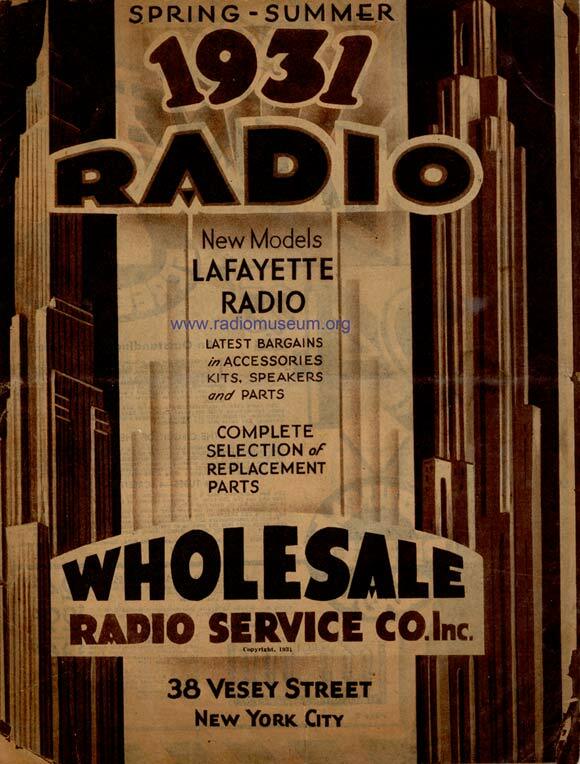 Lafayette Radio Catalog 1931 - Wholesale Radio Service Co.
See also the next main catalog, the Lafayette Radio Catalog 1932, 10th Anniversary without number (for the season 1931/32) and the main catalog before, Lafayette Radio Catalog 1930 also without number - for season 1929/30. Just before this main catalog "1931" was probably the Lafayette Radio Catalog 1930 Spring-Summer which we have not got yet- and directly after Lafayette Radio Catalog 1931 Spring-Summer. 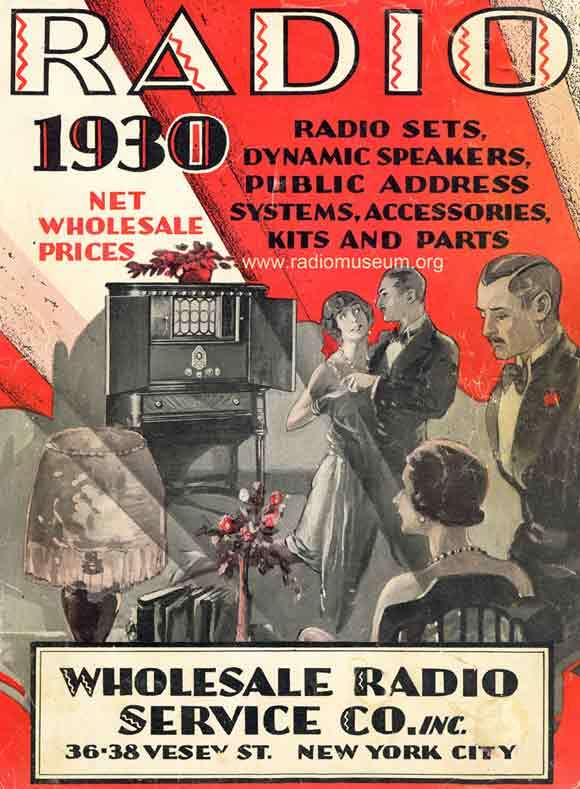 Wholesale Radio Service Co. Inc. is 38 Vesey Street, New York City as in next year, but the catalog no. 53, 1933 shows 100 Sixth Avenue, New York, N.Y. The next page states: Lafayette "The Bonded Radio". 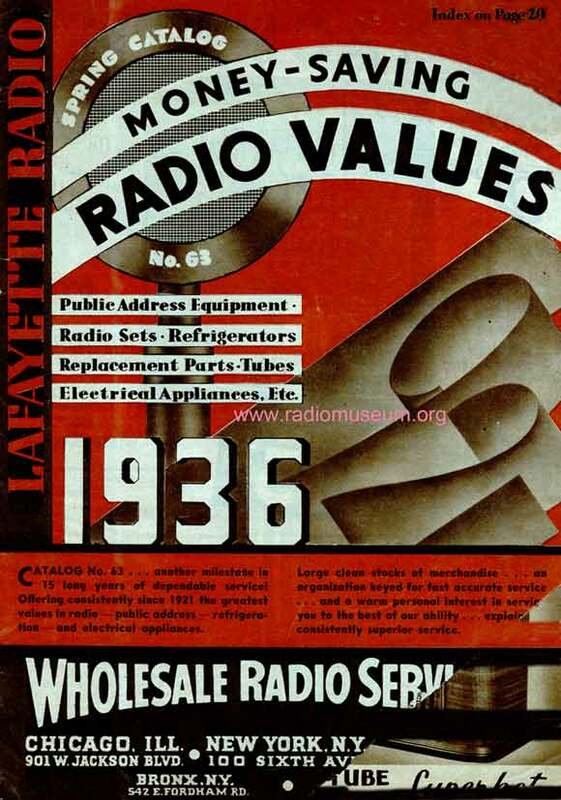 Lafayette Radio Catalog 1931 is for the radio season 1930/31. Since this catalog was most probably distributed in Autumn 1930, we regard the models as for season 1930/31 because they were made and sold in 1930 - and later. "A little over 9 years ago WHOLESALE RADIO SERVICE COMPANY commenced business in a small office on Church Street. The radio industry was in its infancy - growing tremendously fast - and suffering form "growing pains". Concerns would spring up over night, without any code of business ethics, without any desire to give their customers fair, legitimate treatment - and these firms would disappear almost as quickly as they started. Wholesale Radio Service Company, together with a number of other legitimate radio concerns, clearly say the necessity for restoring the confidence of the public in the radio industry. And so we formulated a business policy - a policy which has been our creed for nine years of remarkable progress - which has been responsible for the tremendous growth of this concern to the point where we are now the largest institution of its kind in the East." On page 3 they claim to do over 2.5 million dollar sales yearly, having thousands of satisfied customers. See also the next main catalog, the Lafayette Radio Catalog no. 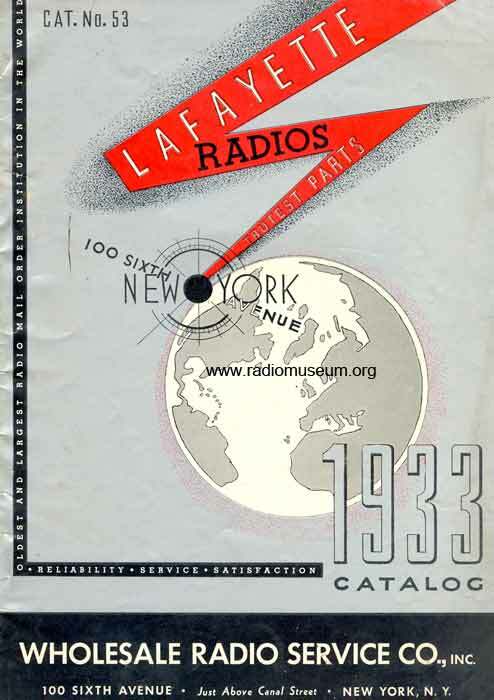 53, called 1933 (for the season 1932/33) and the main catalog before, Lafayette Radio Catalog 1931 with no number and presumably for saison 1930/31. The catalog directly before this Lafayette main catalog was probably Lafayette Catalog 1931 Spring-Summer and directly after this catalog here is the Lafayette Catalog 1932 Spring-Summer. 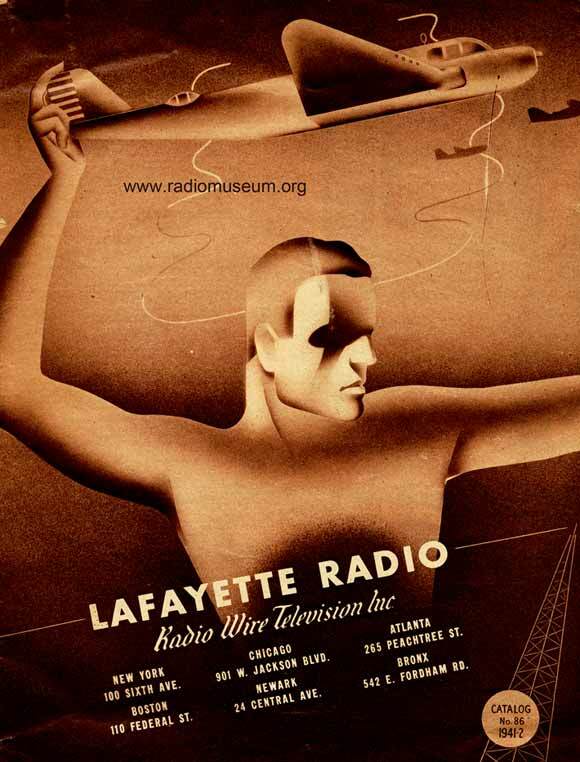 Lafayette Radio Catalog 1932 is for the radio season 1931/32. 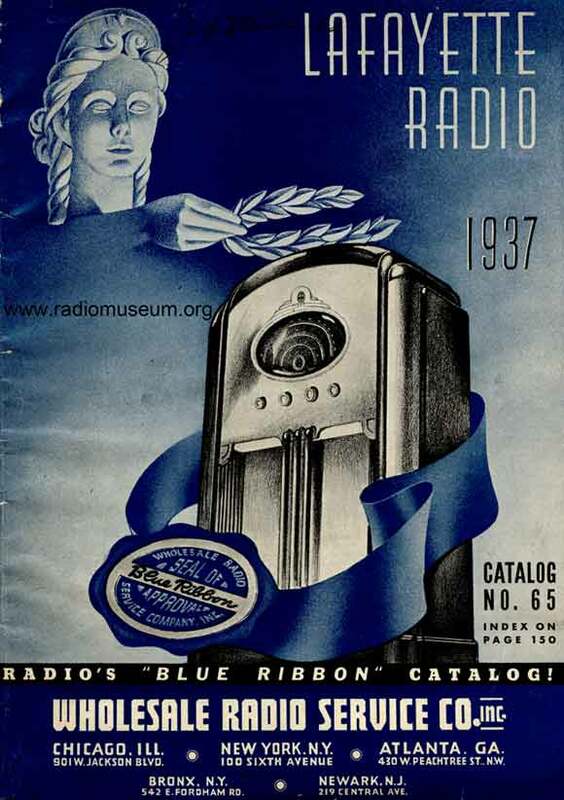 This main radio catalog has most probably been published in Autumn 1931 and production/delivery was in 1931 - and later. Therefore we regard those models as being for season 1931/32. The anniversary catalog shows on page 18 and 19 a text called "1922 - 1932, we celebrate our tenth anniversary. A decade of progress in the radio industry." The catalog shows no catalog number and the year after, the main Lafayette Catalog is numbered 53. On page 18 one finds the statement which is made in every early catalog: "For your protection we publicly announce that WHOLESALE RADIO SERVICE COMPANY is not associated with any other radio concern and never has been." On page 19: "Ten years ago, when the radio industry had just been born, Wholesale Radio Service Company began in a small, two-by-four office, selling a small number of radio accessories. ... Today this company is located in a modern building in the heart of New York's radio section. Our business runs into millions of dollars per year. A large force of men and women are employed to take care of the hundreds and hundreds of orders which come in daily." On page 10 is displayed a letter dated July 7, 1931 to Wholesale Radio Service Co., Inc.
36-38 Vesey Street, New York City about "Guaranty bond covering refunds on Lafayette Radio Sets." The last page, 144, shows us a letter of August 14, 1931. 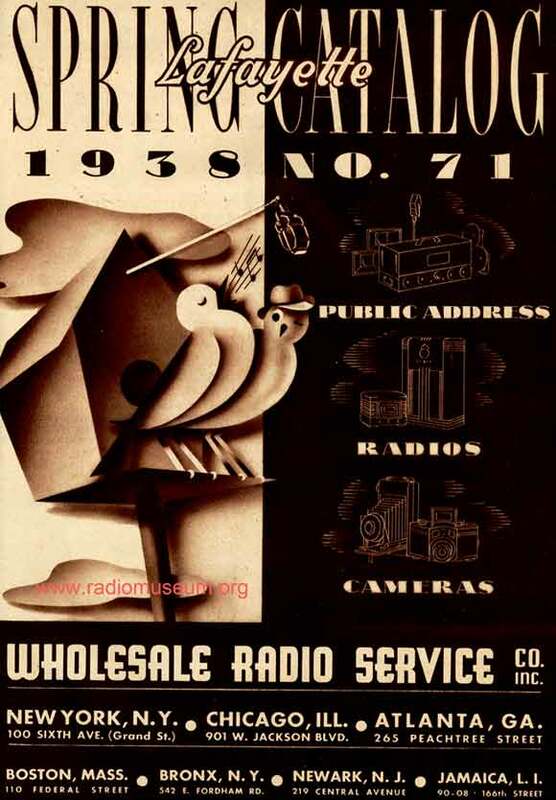 This suggests that the catalog has been published after that date - for the radio season 1931/32. The chassis 10-C (Cadmium plated) with 10 tubes is for the top models like 101 Duo-Symphonic. It has "Visual Meter Tuning", Automatic Volume Control (AVC), 8 tuned circuits (IF=175 kc) and a sensitivity of 1.25 microvolts per meter. The name comes from the "Stadium Speaker" which is a "dual speaker unit" with two speakers, one optimized for higher and the other for lower frequency. The woofer has probably 12.5" diameter. There are two chassis versions, the old one with push-pull and a new one in parallel. The manufacturer was Gulbransen (series 23 chassis, Rider's vol. 2 page 293K to 293P; models 20, 23 and 235, the latter was also sold in Switzerland). We will later try to find out manufacturers for other models. We know at least the following early manufacturers for Lafayette: Gulbransen, Wells-Gardner (B-code? like B-36 but also B-80 for 7-L of WG? one is "La France of WG = 13 tubes), Belmont, Plant "A", Garod, Detrola? With a few textual breaks the catalog displays mantel and console radios up to page 29, following two pages for SW receivers and on page 32 is a short wave (SW) converter. Page 33 shows some parts and 3 Auto Radios. Page 34 and 35 show chassis and kits, followed by 4 tube pages. 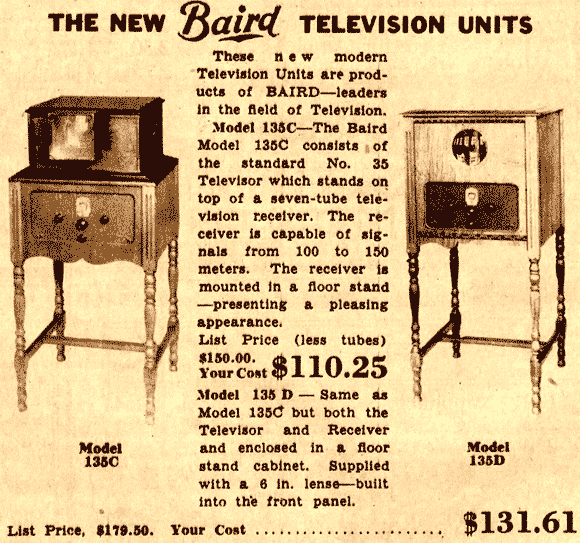 Page 40 displays television including Baird models. Page 41 brings the Talkiola "Talking motion picture machine", Cape Hart record changer, Pam-o-Graph, Presto record maker outfit etc. Page 42 shows the Loftin-White amplifier and the next page Public Address systems. Microphones, speakers etc. are presented up to page 50. This is followed by phono chassis and motors etc. Page 54 through 58 is for testing instruments and page 59 through 66 offer transformers. Pages 67 through 90 are full of different parts like resistors, condensers, knobs etc. and page 91 and 92 are for aerials. Transmitting apparatus can be found on pages 93 to 95, followed by "Everything for the HAM". Page 102 and 103 are for any kind of tools and page 104 to 111 for Lionel trains and accessories, followed by action toys for boys and girls. Ordinary kitchen and bath appliencies, followed by clocks on page 118 and 119. The index is found on page 120. Then follow articles for sports, clothing and the last pages, 142 through 144 are full of selling texts ... 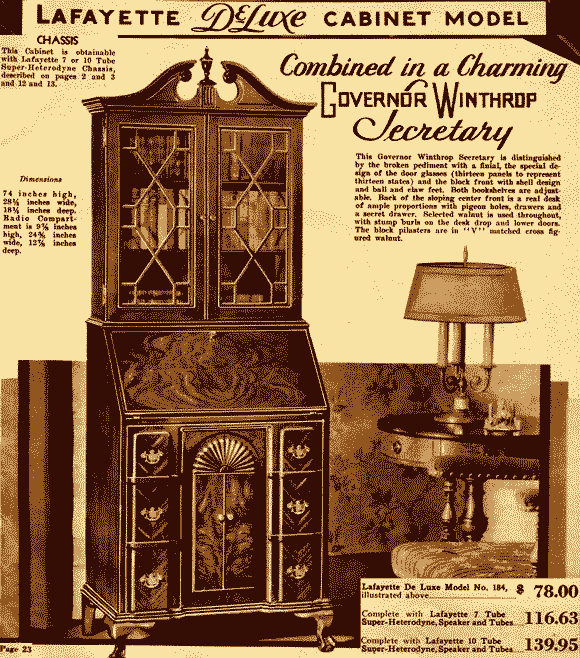 The content list is similar in the early 1930s catalogs. See also the next main catalog, the Lafayette Radio Catalog no. 55, called 1934 (for the season 1933/34) and the main catalog before, Lafayette 10th Anniversary catalog 1932 with no number and presumably for season 1931/32.. The catalog directly before this Lafayette main catalog was probably a Spring catalog 1933 (no. 52?) and directly after this catalog here is the Lafayette Spring catalog 1934, no. 54. Each model from this catalog I link to here - sometimes also back to the model. We then have a common text for each model of this catalog and can inform about the specific model year etc. We then don't have to change on each model if we find something new or an error etc. In this catalog, beginning page 7 we find "Dual-Wave" chassis (M-39 and M-40 with models M-41 and M-42, Rider's 10-8) for eight tubes. There is quite a variety on models: For the same Rider's schematic 10-8 (M-43) follow also the 8 tube "Trio-Wave" Superheterodynes on page 10 in the catalog. In theory the models M-41 and M-43 should be the same - Rider's did not use the chassis number but a model. But now the tubes in the catalog are changed and the sensitivity is given as under 1 microvolt - before as under 2.5. The tubes mentioned in the catalog are 3 x 58's, 2 x 57's, 56, 47, 80 - in Riders 56, 58, 58, 58, 55, 47, 80. We noted also some typos on the cycles for 220-240 volts, but the chassis we hope to clear one day. Interesting to see is that the Rider's schematic was published in 1939 for a model of 1932/33 and drawing date Sept. 26, 1935. On page 8 we find the "Dual Wave"-chassis M-47 (115 volts) and M-48 (for 220-240 volts) with 10 tubes (Rider's 6-10). The chassis are used for models M-49 and M-50. The chassis L-1 for 105-120 volts and chassis L-2 for 220-240 volts 40 cycles or 110 volts 25 cycles share the same schematic - and also L-3 and L-4 are listed on that Rider's schematic 5-9. 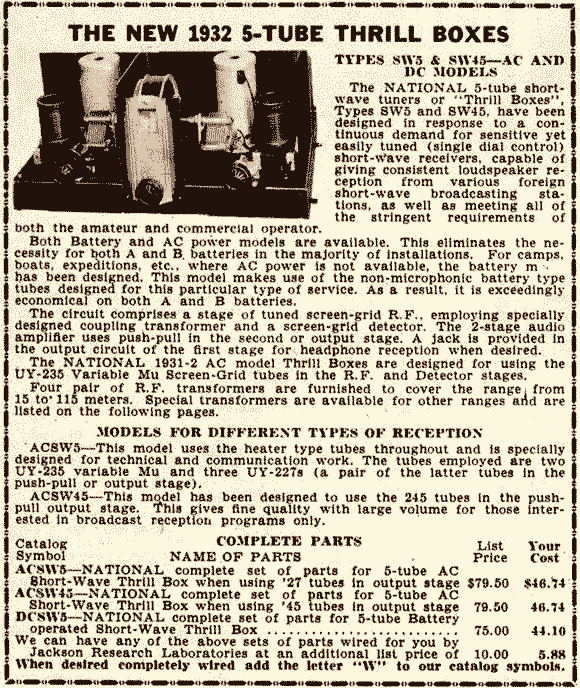 But the same schematic/chassis is also used for the models L-5, L-6 and - displayed on page 137 of the catalog - the models with Capehart record changer as L-7 and L-8 and with Capehart two-speed phonograph L-9, L-10. The higher number in a name pair is the higher voltage. The given voltages for L-2 in the catalog page 12 are not repeated for other models but 220-240 volts 25 - 40 cycles. Both can be true. Elsewhere (where?) All these models are called "De Luxe" in the catalog. Elsewhere (but where?) I noted also L-3 and L-4 as "Regent" and L-5 and L-6 as "Viceroy". The models feature Automatic interference suppression, manual interference control, automatic volume control, triple dial tuning, improved twin voice dynamic speakers, tone control and an illuminated tuning meter. Sensitivity is less than 1 microvolt per meter, selectivity for 10 kc separation. It delivers potentially 18 watts but this has been reduced to a max. of 10 watts. Current consumption is 110 watts. Which is the origin of this top model? To find the different schematics for this 12 tube model is easy: With the "Professional Modelsearch" for members, asking for the combination: 12 tubes - with the following 5 only involved - 58 56 57 46 82 and the tic field "only" we get the 6 following manufacturer/brands: Gulbransen (model 322), Lafayette (10 model pages), Montgomery (5 models), Radiolek (SR230), US-Radio and Wells-Gardner (O22) - all with a Rider's schematic. When comparing those schematics we find that at least the following 3 are identical - also the chassis drawing: Gulbransen (Rider's 3-11), Wells-Gardner (4-10) and Lafayette (5-9) - which was published first in 3-1 under Wholesale! Montgomery Ward (15-43 and 15-44!) shows exactly the same schematic and the same chassis can be seen on 15-44 - volume 15 was made 1947! (the SchematicFinder found it) - and we know that it was a department store chain and not a radio manufacturer. Rad Olek (4-1) is a simplified schematic of probably the same schematic - and is a catalog seller too. US Radio & Television Corp. (4-3) uses IF 262 kc and an other chassis. We also have to know that Gulbransen bought Wells-Gardner in 1930 and kept the manufacturer name as Wells-Gardner, division of Gulbransen. 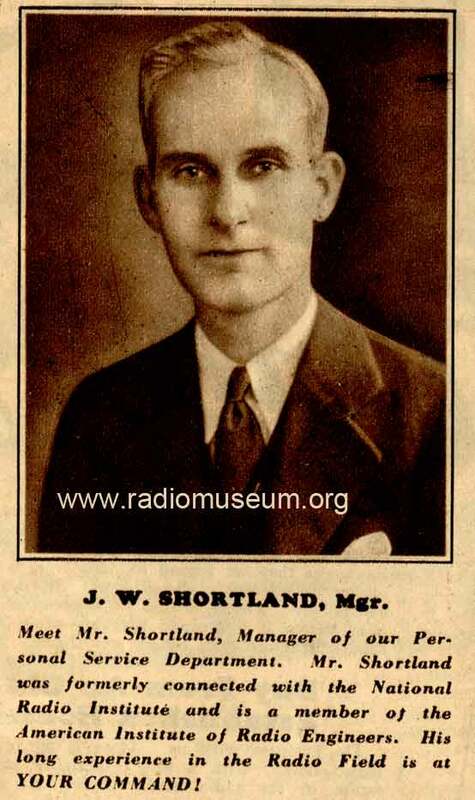 Appearance in "The Radio Trade Directory"
Unfortunately I have only the volume Aug., 1925 because it exists as reprint. In this issue we find "Lafayette - see Kor-Rad Co.". on page 143 for "Speakers". For Vacuum Tube Sets we find on page 130 the same line plus below: "Lafayette - see Mississippi Radio Co." We don't know if at the same time two companies claimed the brand or if they worked together - and we don't know if an other company was involved too with Lafayette. See our pages for Mississippi Radio Co. St Luis and for "The Kor-Rad Co.". 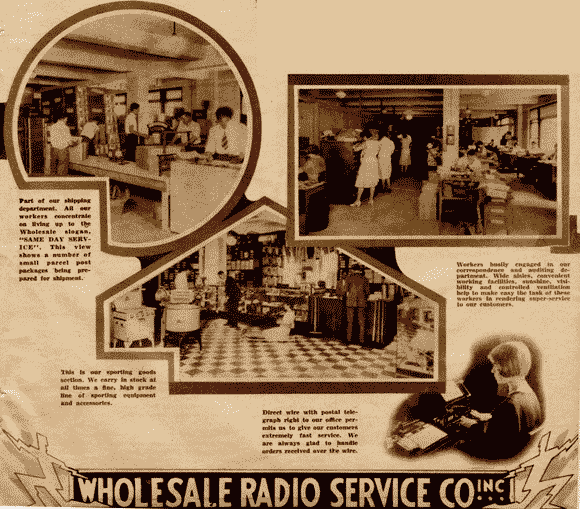 The first Lafayette radios in Rider's Perpetual are found under Wholesale, not under Lafayette. Volume 1 (printed 1931-34) shows the Duo-Symphonic 1931 and "Great Duo-Symphonic" (1-1) and the Duo-Symphonic 1930 (1-2). Rider's vol. 3 (printed 1933) shows the models L-1 (3-1), L20 (3-2), M-31, M-35, M-37, M-53 (3-3) and "Auto Radio" (3-4). In the digitalized index is found 05A AC/DC, 53 and 37 which is wrong (M-53 and M-37 ...). In the "Abridged Volumes I to V" there is no trace of Lafayette or Wholesale. Rider's Perpetual shows its first Lafayette radios only in volume 4 (models A-11, A-12, A-14 and A-19) under Misc. (miscellaneous) and in volume 5 under Lafayette - for instance 5-9 for the 12 tube top model with a visual tuning meter. Also the volume adjustment and tone selector show their setting in a scale, but the models with "Dual twin voice dynamic speakers" are for broadcast only! Interesting to see that the same schematic for L-1, shown under Wholesale in Rider's 3-1 is now appearing under Lafayette as 5-9, now for L-1, L-2, L-3 and L-4. Rider's volume 13 (printed 1942) displays nearly half (17) of the Lafayette again under Wholesale - but other models (ca. 20) are found under Lafayette. Wholesale according to digital index (with errors): BS3, S53, 19, 269, C16, 259, CC57, 493, CC57T, 939, CC98, C116, C34, 3790, M42, C117 and C125. Probably correct = BS-3 (13-1), S-53 (13-2), C-16, C-19, 259, 269 (13-3, the last two probably the chassis of the ones before), CC-57, CC-57T with chassis 493 (13-4), CC98, chassis 939 (13-5), C-116 (13-6), C-34, 3790 (13-7), M42 (13-8), C117 Series B (13-9), C125 (13-10). There is still more investigation necessary: Rider's Lists models from "Radio Wire Television" already in volume 5 from 1934 - all through volume 19 from 1949 (copyright) - except for volume 14. Radio Wire Television is the new name for Wholesale Radio Service. Co. Inc. in 1939. Which are the models for the brand Lafayette - which not? Only the detailed model pages will tell when we have created them fully. We will have to decide if we keep the models under the two names or join them. Here are the model pages of Radio Wire Television. 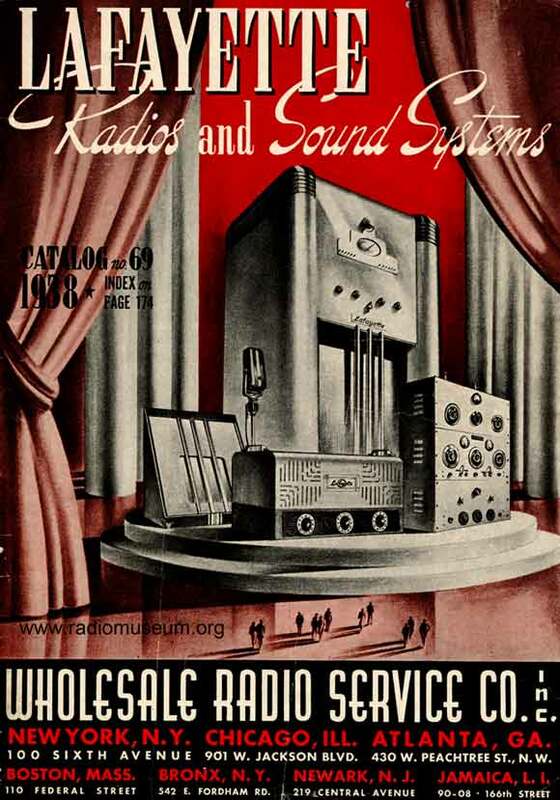 The "Radio Collector's Guide 1921-1932" by Morgan E. McMahon lists the following models from Lafayette under "Wholesale": On page 185 for 1929 model "Preselector" (7 tubes SG, PT, 2 tuned circuits, 2 audio stages) and for 1930 "Duo Symphonic" (9 tubes TRF, one untuned circuit, 3 tuned, 3 audio) and AC524 (5 tubes SG, 2 tuned, 1 audio). Page 262/263: "Tru-Test" (mantel 5 tubes TRF, $ 16.50), "Lafayette" (mantel 6 tubes TRF, 3 x '24 RF Amp., '24, '45 and 80), "Lafayette" (10 tubes Superhet with AVC, tone control, chassis), a chassis no name (TRF for SW for $ 45.50 less batteries), SW converter (3 tubes Superhet, tubes 24, 27 and 26 for $ 29.50), 5 tube Superhet (for $ 21.50 mantel), and a 7 tube Superhet (24, 24, 27, 35, 35, 47, 80 mantel). and the main catalog before this one here, Lafayette Radio Catalog no. 55, 1934 for 1933/34. But directly next after this catalog here is the Lafayette catalog No. 57, Spring + Summer 1935. followed by the catalog no. 58. The catalog directly before this Lafayette main catalog seems to be the mentioned main catalog - and some supplements. Like Supplement C with 80 pages. The other supplements we still miss. Work here still on progress - after entering the corresponding models, pictures and enhancements. But directly next after this catalog here is the Lafayette catalog No. 58, which we still miss. "For 14 years we have guarded the Truth valiantly. We have stated our policies openly and frankly. We have pledged lowest wholesale prices. We have promised 24 hour service. We have insisted upon quality merchandise above everything else. Because we have faithfully performed the promises made to you, we have grown to be the Biggest, the Most Outstanding Exclusive Radio Mail Order House in the entire world! Time Discovers the Truth: that is why thousands upon thousands of customers have become our most loyal and staunch supporters. Meanwhile, the Envious, the Jealous, the Inexperienced attempted to counterfeit our formula of success. They copied our slogans; they imitaded the style of our catalog; they reproduced our illustrations (on which pont we have law suits pending); they even did business under names which sounded like ours ... all in a futile, vain attempt to mislead and deceive you. ..."
About the organization: page 1 - 3. Radios: page 4 - 17 (starting with C-18, C-30, C-12 and converters XP15914, XP15953). Battery radios: page 18 (See models F-55, F-56, A-83 and B-64). Receiver kits: page 19 (XY22069, XY22012, XY22037, XY22038). Receiver chassis: page 20 - guides to model pages. Auburn chassis: page 21 (C-50, C-75, C-76, C-92, C-93). Car radios: page 22 - 23 (See models AM-20, C-40, L-30 and B-62). Auto radio accessories: page 24 - 26. Tubes: 27 - 29 (also Acorn tube, neon glow lamps and deForest / Eimac transmitting tubes). Home electrical appliances: 30 - 32. Sound facts and amplifiers. speakers, pic-up's: page 49 - 77. Short wave receivers (amateur communications): page 78 - 82. Test equipment, books: page 83 - 91. Truetest power transformers: 92 - 97. Condenser blocks: page 100 - 105. Volume controls, resistors: page 106 - 115. Variable condensers and chokes: page 116. Dials, coils, switches, sockets, tools, radio hardware etc. : page 117 - 128. Has any member (or guest) catalogs we miss (see second link above)? After having entered the models for this catalog or completed them, I will go on with the text here. At the moment it is only an URL for the link in the corresponding models. See also the next main catalog, the Lafayette Radio Catalog no. 65, 1937 for the season 1936/37 and the main catalog before, Lafayette Radio Catalog no. 59, 1936 for season 1935/36. and the main catalog before this one here, Lafayette Radio Catalog no. 59, 1936 for 1935/36. But directly next after this catalog here is the Lafayette catalog No. 66, followed by the catalog no. 67 and catalog no. 68, Spring-Summer 1937. The catalog directly before this Lafayette main catalog is the catalog No. 64, and before that is the catalog no. 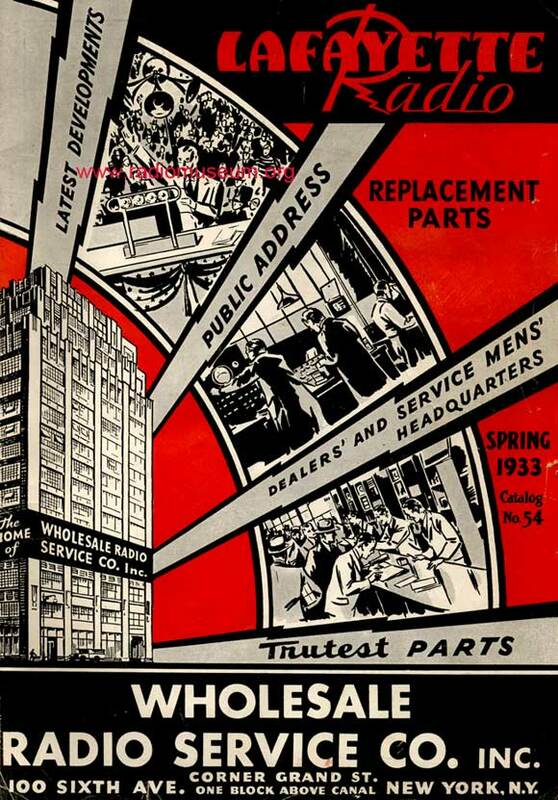 63, Spring 1936 - and 3 more follow before to the previous main catalog. Inside, the cover features the model D-11 and J-33 for Europe but same case/chassis (LW). Page 1: J-35, J-36, J32. Page 4: D-13, D-10. Page 5: J-45, J-44, EB-8. Page 6: Console D-30, Mantel D-31. Page 7: A-22, A-26, D-20. Page 8: B-81, B-80. Page 9: Console B-82. Page 10: B-87 (chassis). and the main catalog before this one here, Lafayette Radio Catalog no. 65, 1937 for 1936/37. The catalog directly before this Lafayette main catalog is the catalog No. 67, and before that is the catalog no. 66 which both we still miss. I link this thread to each model from this catalog. We then have a common text for each model of this catalog and can inform about the specific model year et. We then don't have to change on each model if we find something new or an error etc. At this time an odd catalog number seems to show the models of next year - selling already in late Autumn and in Winter. Even numbers are more or less Spring catalogs. In this catalog for 1937 Lafayette mentions 6 showrooms: New York NY, Chicago ILL., Atalante GA, Newark NJ, Bronx, NY and Jamaica LI. See also the next main catalog, the Lafayette Radio Catalog no. 73, 1939 for season 1938/39 and the main catalog before this one here, Lafayette Radio Catalog no. 65, 1937 for 1936/37. But directly next after this catalog here is the Lafayette catalog No. 70, followed by the catalog no. 71, Spring 1938 and catalog no. 72. The catalog directly before this Lafayette main catalog is the catalog No. 68, Spring and Summer 1937 and before that is the catalog no. 67 and catalog no. 66. The member Vitor Oliveira, Portugal has introduced the models from his own catalog in 2006. Therefore we will have to change 1938 to season 1937/38, enter a selected catalog plus individual text (without page number) and enter a link to here in the notes. Manually we will have to change some of the model names. 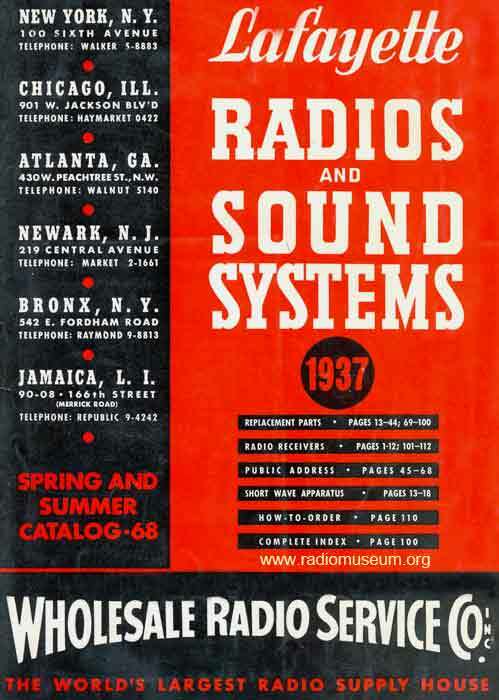 "Lafayette Radios and Sound Systems" is now the title on this 1938 catalog from Wholesale Radio Service Co. Inc., 100 Sixth Avenue. They have now offices and/or sales rooms at Chigago, Ill., 901 W. Jackson Blvd. ; Atlanta, GA, 430 W. Peachtree Street, N.W. ; Boston, Mass., Federal Street; Bronx, NY., 542 E. Fordham Rd. ; Newark, NJ, 219 Central Avenue and in Jamaica LI, 90-08, 166th Street. and the main catalog before, Lafayette Radio Catalog no. 73, 1939 for 1938/39. The catalog directly before this Lafayette catalog, no. 74 we miss. The catalog directly after this one is no. 76, 1939 Spring-Summer. The copyright notice on page 2 below right proofs that it is for Christmas 1938 (not 1939). Therefore the models get the date for season 1938/39 (not 1939). In this catalog for 1938 Lafayette mentions again 7 showrooms: New York NY, Chicago ILL., Atalante GA, Newark NJ, Bronx, NY, Jamaica LI - and Boston, Mass. Mainly Lionel trains with gauge "0" and "00", some educational and entertaining toys, household appliances, electric clocks, cameras - projectors - and all what is needed to produce or look at (26 pages! ), record players (page 51). Radios are on the last pages, 52 to 64 and on page 24 one finds the auto radios D-6 and M-94, Hallicrafters Sky-Buddy (K21094) and "Beginner's All-Wave Kits K10356, K10357 and K10358. Page 51 shows the electric record-players models: K21964, K21965, K21966, K21967, K22005, K22006 and K22012. What is done? : Picture at company page. For introducing models we first check if the models have been offered before. Felix Schaffhauser is entering the models for the catalog 73, 1939 for season 1938/39. Later we link this thread to each model from this catalog. We then have a common text for each model of this catalog and can inform about the specific model year et. We then don't have to change on each model if we find something new or an error etc. and the main catalog before this one here, Lafayette Radio Catalog no. 73, 1939 for 1938/39. The catalog directly before this Lafayette catalog is no. 75 Gift Catalog 1939 for Christmas 1938. We miss the one after, no. 77. We link this thread to each model from this catalog. We then have a common text for each model of this catalog and can inform about the specific model year etc. We then don't have to change on each model if we find something new or an error etc. In this catalog for 1939 Lafayette mentions again 7 showrooms: New York NY, Chicago ILL., Atalante GA, Newark NJ, Bronx, NY, Jamaica LI and Boston, Mass. Has somebody knowledge about the radio amateur models Lafayette sold and could work on that part? It is a most interesting part. 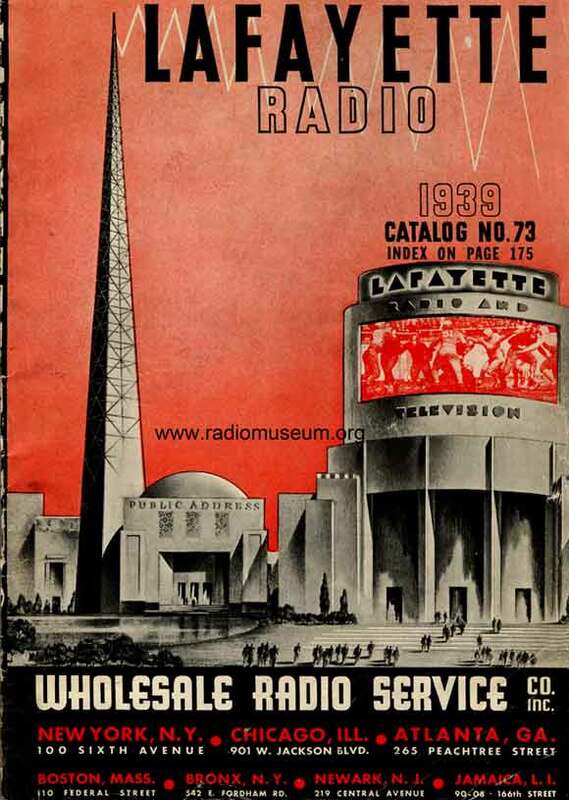 See also the next main catalog, the Lafayette Radio Catalog no 85 which we still miss and 86 (1941-2) for season 1940/41 and the main catalog before this one here, Lafayette Radio Catalog no. 73, 1939 for 1938/39. But directly next after this catalog here is the Lafayette catalog No. 79, followed by catalog no. 80, Spring-Summer 1940, catalog no. 81 and catalog no. 82, followed by the catalog no. 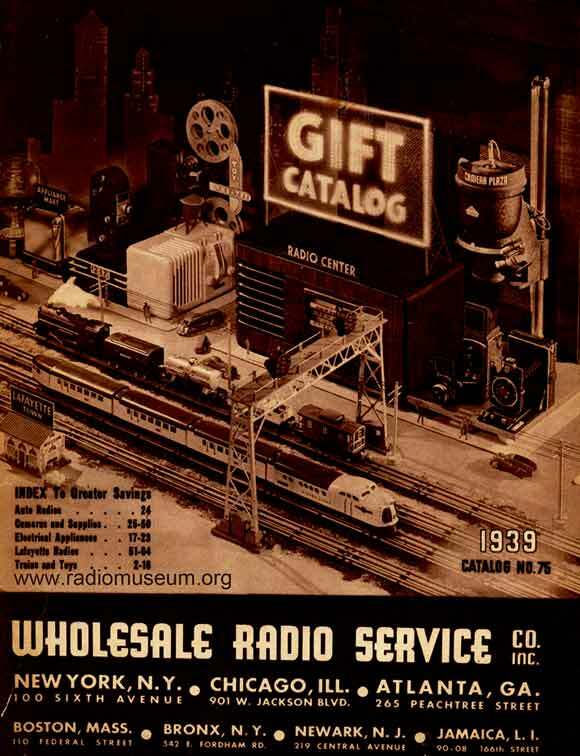 83 "Gift Guide 1940". The catalog directly before this Lafayette main catalog is the catalog No. 77 which we miss. Before that is no. 76, Spring & Summer 1939. See also the next main catalog, the Lafayette Radio Catalog no. 85, 1941-1 for season 1939/40 and no. 86, 1941-2 for the same season. The main catalog before this Spring catalog here is Lafayette Radio Catalog no. 78, 1940 for 1939/40. The catalog directly before this Lafayette catalog is no. 79 which we miss. We also miss the one after, no. 81. We link this thread to each model from this catalog. We then have a common text for each model of this catalog and can inform about the specific model year et. We then don't have to change on each model if we find something new or an error etc. In this catalog for 1940 Lafayette mentions again 7 showrooms: New York NY, Chicago ILL., Atalante GA, Newark NJ, Bronx, NY, Jamaica LI and Boston, Mass. But like the main catalog no. 78, 1940 for season 1939/40 the company name is "Radio Wire Television, Inc. formerly Wholesale-Radio Service Company, Inc."
I handed this catalog over to Mr. Schaffhauser on 6th July 2010 including catalog no. 82 - on which Mr. Schaffhauser will start. But directly next after this catalog here is the Lafayette catalog No. 83, Gift Guide 1940. The catalog directly before this Lafayette main catalog is the catalog No. 81 which we miss. Before that is no. 80, Spring-Summer 1940.
for season 1940/41 - called "20th Anniversary". The Swiss member Felix Schaffhauser has just informed me (October 28, 2010) that he has created the model pages for the Lafayette radio models in this catalog and that he will go on with catalog number 80. We again have linked each model with this text - which again leads to other Lafayette texts. For catalog 82 we have not yet created the model pages for gramophones, amateur, PA, amplifiers, kits etc..
See also the next main catalog, the Lafayette Radio Catalog no. 87, 1942 copyrighted 1942. The main catalog before this one here is Lafayette Radio Catalog no. 82, 1941 for 1940/41. But directly next after this catalog here is the Lafayette catalog No. 87 which we miss. The catalog directly before this Lafayette main catalog is the catalog No. 85 which we miss. Copyrighted 1941 by "Radio Wire Television Inc.". There are only 6 Addresses given: New York, Chicago and Atlanta as the "Warehouses" - as before and "Local Sales and Display Rooms" are: Boston, Newark and Bronx. Jamaica, LI, is now missing. Page 2: JS-319, JS186, JS187, D-247, D-248. Page 3: MA-322, MA-324, S-165. Page 4: JS-190, JS-188, JS-189, D294. Page 5: C-200, C219, D-251. Page 6: G-331, JS-320, JS193. Page 7: D-233, D-246, B196. Page 8: S-317, T-325, EB-240. Page 9: C-211, C-210, C-205, C-201, C-212. Page 10 (consoles): C-213, FE-286. Page 11 (consoles) B-275, JS-300. Page 12 (consoles) B-274, B-273, B-273W. Page 13 (consoles) FE-255, FE-254. Page 14: JA-328, FE-142. Pages 16 - 19 (consoles): JS-192 Symphony Period", JS-304, JS-303 Symphonie Modern", TC-297 (19 tube Concerto), TC-299 and TC-287. Page 20: MA-323 Aviator, MA-3, D-291. The following pages are for tubes, books, communication receivers, beginner's sets and accessories, home electric record players (page 24), pick-ups, meters, test instruments from different brands, speakers, parts, sockets, set builders accessories, tools, fluorescent lamps, gifts, cameras and everything for darkroom outfits etc. See further down for an ohter lafayette catalog no. 87! See also the next main catalog, the Lafayette Radio Catalog no. 88, copyrighted 1947. The catalog directly before this Lafayette main catalog is the catalog No. 86, 1941-2. This catalog no. 87 in two versions is the last until WW2. Copyrighted 1942 by "Radio Wire Television Inc.". There are now only 4 Addresses given (6 in the catalog no. 86, 7 in catalog no. 85): New York, Boston, Bronx and Newark - all now warehouses, but missing the former warehouses Chicago and Atlanta. See below for these two. No "Local Sales and Display Rooms". We can read on page 2: "Today, we face a crisis in our lives - yours and ours. During the present Naional Emergency it is vital that the field of radio communications be mainteined ..." The manufacturers have to build army stuff and to quit production of civil radios. There are two different catalogs for no. 87! Cover inside: Models: JA-308, JS-241. Page 1: JS-269, JS-270, JS-271, JS-272 (color variants only), JS-242. Page 9 FM Adaptor K21064. The following pages are (not in this order) for tubes, books, communication receivers and tansmitters (page 55-59), beginner's sets and accessories, home electric record players (page 24-26), pick-ups, meters, test instruments and oscilloscopes from different brands (10 pages! ), speakers, hearing aids, (page 93), parts (including racks, panels and cabinets, handlers, knobs etc. ), sockets, set builders accessories, tools, fluorescent lamps. 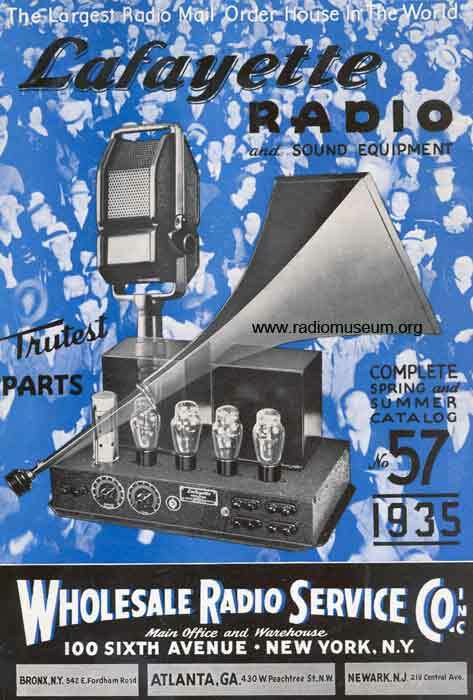 See front cover picture, Radios starting at page 2 (not cover inside) with models JS-166 and JS-186B. 128 pages, size 255 x 178 mm. Startling is the fact that both catalogs bear the same number. Looking at the warehouses listed on the front cover it is clear that the different warehouses have here different stock. It seems to be clear that because of the war there was no more ordering from the manufacturers possible. This catalog here is only for Chicago and Atlanta. Except for the two models D-294 and D-251 the content is different! 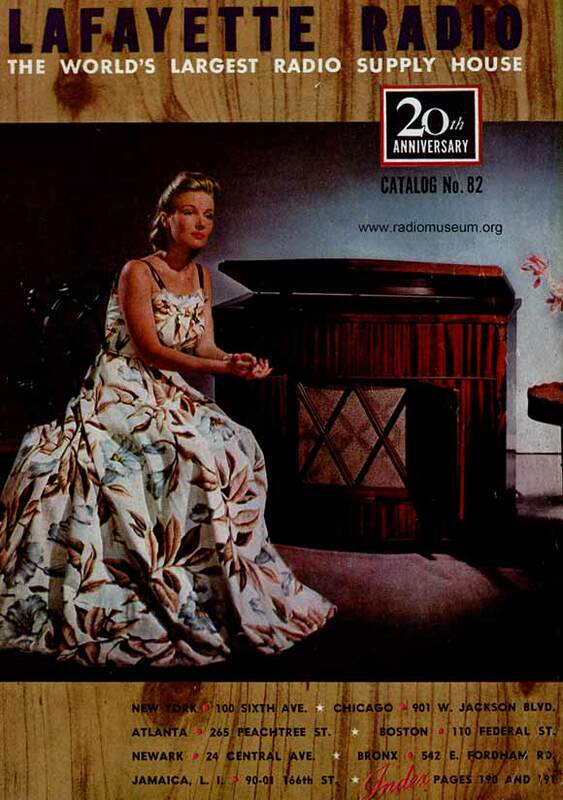 See also the next main catalog, the Lafayette Radio Catalog 1948 (for the season 1947/48) and the main catalog before, Lafayette Radio Catalog no. 87, 1942 for 1941/42. The catalog directly before this Lafayette main catalog was probably above Lafayette Catalog no. 87 and directly after this catalog here is probably a Lafayette Catalog 1947 for Spring-Summer. Lafayette Radio · Radio Wire Television, Inc.
110 & 130 Federal St., Boston 10, Mass. 542 E. Fordham Rd., Bronx 58, NY. Adresses and number of locations are the same as in 1942. Pages 1 to 3 feature 6 different radio models, some with color versions and some without any price. 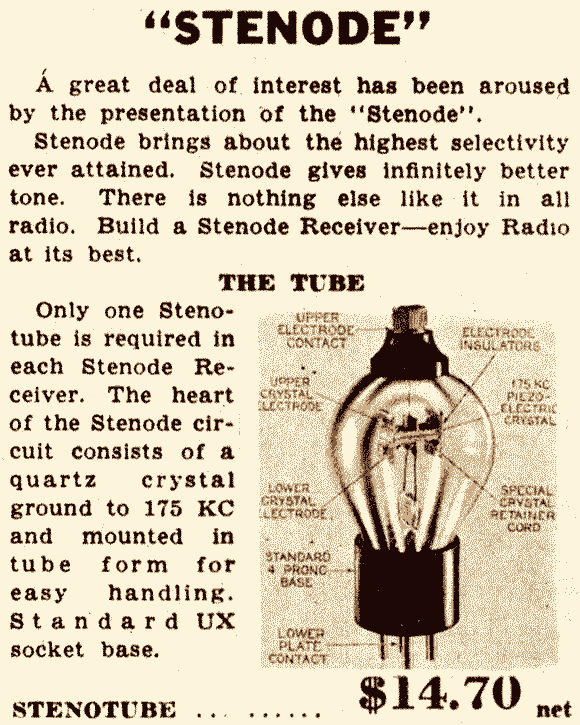 On pages 4 and 5 feature 4 phono-radios without any price, but tubes are given. Pages 6 and 7 show 6 console combinations, no tubes given nor the tube count. This is followed by two pages for selling tubes, two pages for batteries, followed by 6 pages (12 - 17) of record players and accessories. Pages 18 to 41 deal with sound systems icluding Talk-a-phone intercommunication system (page 29), microphones, loudspeakers and plugs etc. Test equipment is offered on page 42 through 54. Pges 55 through 96 offer all the necessary parts and tools and material for a service man or hobbyist. On the pages 97 to 103 we can see branded receivers like "National" (HRO), Hammarlund, Hallicrafters, McMurdo Silver, etc. including transmitter units or sub units, followed by such parts on pages 104 to the end. They include some Lafayette kits for amateurs, keys and accessories and even books and some more laborytory type RCA test equipment. This interesting Lafayette FS-103 valve/tube set has recently come up for Ebay sale. (Ebay item 271278544065). I am having great difficulty finding out anything about it. On the backboard it has "Japan". I was aware of the 1960's Trio/Lafayette link but this set is clearly much earlier - 1940's? What is the earliest year that we have for Lafayette sourcing from Japan? Or was there a licence deal with a particular Japanese manufacturer? 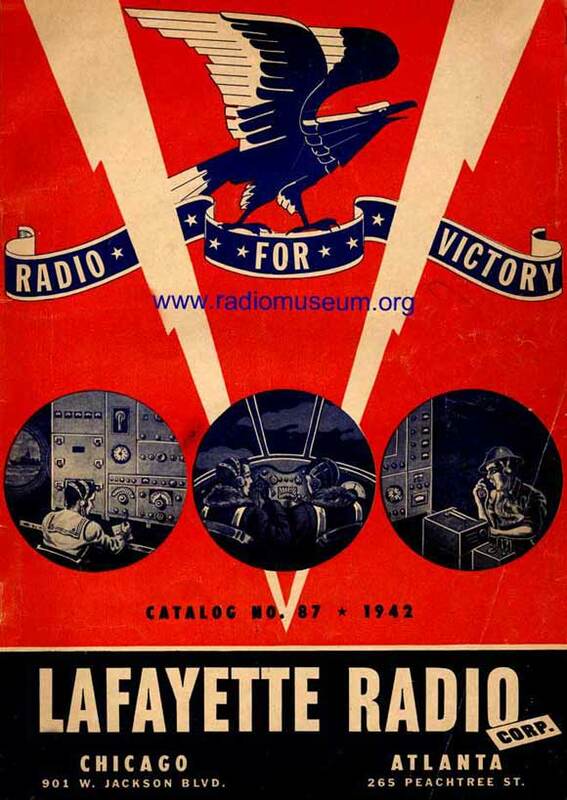 For Lafayette USA I have searched for all the radio catalogs from before WW2 and bought them. Then I worked through them by creating the models from the data in the catalogs, scanning and preparing the pictures and uploaded them and for each catalog I started an article plus some main articles to form a framework for Lafayette. As you can see here, I followed up to later years, but I did not find a connection to Japan. You might ask our member Tadanobu Okabe, who shows a nice banner link to us and has written the English country text for Japan. You have also begun a collection page by creating a model ICF-32 for Sony. At the moment you have not selected the front picture for your set in your collection or profile. It was also not the first photo uploaded for that model page and therefore your collection page shows only a part of that model. I'm sure you will select the picture you like of the ones you loaded to the model. My suggestion would be to create a Sharp model 5M-67 for Japan and a Lafayette FS-103 for USA. At that time it was often the case that US manufacturers and US brands ordered at least some of their models from Japan. It is good to write the origin in the notes. You are most welcome to enlarge our collection for any country or brand. We miss active members who would help to do the same I have done for Lafayette USA. John Kusching (USA) would be most glad to provide information on which brand to begin with and could also send catalogs or other information for doing this. He is the most active member in the USA. Anyway: Thank you for your participation! There were (and are) OEM makers that never sell under their own badge. HTC used to do this with phones. New Hope Electronics (Japan) appears to have supplied Shira, TEC (Tokio Electronics), Binatone and Shewa Bros. Pye sold Pye, Ekco and Invicta models made by Japanese companies, as well as having their own Hong Kong factory (Empire Made) from early 1960s. Before EMI / HMV took over the Marconi/Marconiphone domestic brand in late 1920s or early 1930s, Plessey made many Marconi sets. They made most of the Defiant sets for Co-op. They may have made many "Westminster" sets for Currys and made a virtually identical set for Ever Ready and EMI (Marconiphone branded). Many Lissen/Ever Ready sets used same Chassis as Pye Models 1935 to 1938. Conversely eventually all Mullard Radios from later 1930s are mostly really Philips as Philips owned Mullard from 1928. Similarly some 1950s Schaub-Lorenz and Kolster Brandes sets are very similar as ITT owned both for a very long time before rebranding to ITT. There is was never a connection at all between Ever Ready, Plessey, Marconi, Cossor, Pye, Co-op during the period 1919 to 1950 other than OEM (Industry contractor and customer) even though some identical chassis and near identical Models. So two identical models may simply mean the same OEM source or one maker sold to the other, and no connection between the companies other than supplier and customer. This also applies to valves/tubes with Philips/Mullard buying US tubes and rebranding Amerity. RCA and Sylvania also produced tubes for each other. Apple sues Samsung over phones yet the 1st iPhone used Samsung designed ARM CPU and current iPhone has much Samsung value parts including CPU. Companies buy often where they get the best deal and all makers "outsource" from time to time even to "retail enemies". So we can "read nothing into" two identical models from different Brands. Sometimes makers have even delibrately copied a competitor in a different market (with or without a licence!) in their own manufacturing. Thank you both for adding to the discussion. Unless I am mistaken, I already have model proposal pending for the Lafeyette FS-103. Lafeyette as a radio manufacturer has fine pedigree, certainly. But possibly post-WW2, like so many other now defunct US radio marques, when facing market loss due to Japanese encroachment into their home market, they may well have decided to attempt to cooperate with their Japanese competitors. So by branding a set as "Lafayette" its entry into the US market would be eased. May I mention another example of Lafeyette re-branding a Japanese set. I have in my own collection a Sansei Hi-Mood FM set, RMorg model No.239666. I then noticed the same radio branded as a Lafayette on Ebay sale and successfully proposed it for a model page - No.239945. So I was not surprised to see a Japanese sourced Lafayette with the FS-103. But I really thought that the FS-103, with its lacquered wooden case, was very much earlier - 1950 at the very latest. But now it does not appear so strange - look at the 1956 wooden-cased Sony TR-72 Gendis for example. So I started this thread thinking that I might have discovered a possible late-1940's or even earlier Japanese Lafayette link.